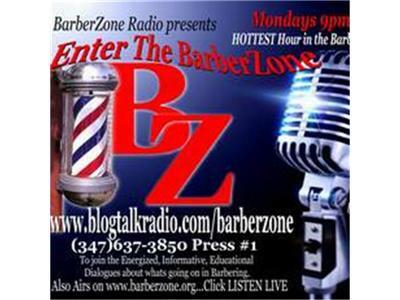 "Enter the BarberZone" BlogTalkRadio Show... The HOTTEST HOUR in the Game. Join us EVERY Monday 9pm EST(Eastern time) for Informationative,Candid, Educational, Entertaining Dialogues about what happenning in Barbering & Our community. "Enter The BarberZone" to discuss how community service & giving back are vital in barber shop & salons. Voice your opinions about our Topic of the Week...Call in #3476373850 and Press 1. "Come Get Your Head Right"